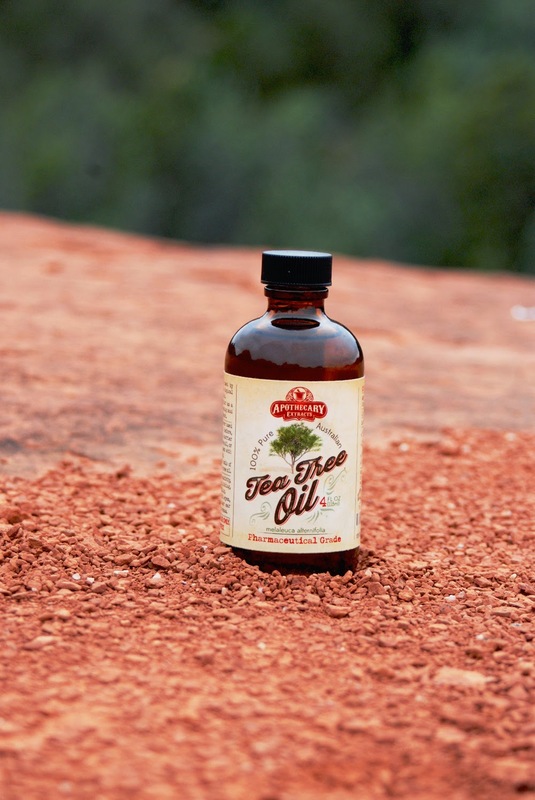 Tea tree oil has been a long time staple in our cabinet. When asked by Apothecary Extracts to review their fabulous tea tree oil, I knew I had to share with my readers my personal testimony of this oil. First off, I'm going to tell you that I think everyone should own their very own bottle of tea tree oil. For those of you who would like a little background on the source of tea tree oil and the uses of it, you're in for a real treat today. Today we know that the oil extracted from the Melaleuca tree, called Melaleuca oil or Tea Tree Oil, serves a multitude of purposes from healing to cleaning and cosmetic treatments to holistic healing. I've always used tea tree oil for clearing blemishes on my skin, as an anti-septic on scrapes or cuts, face cleanser, sore throat soother, and cold ease. It's scent has always intrigued me as well. If you haven't smelled this wondrous scent before, it's a cross between peppermint and patchouli. I find it very calming but also the strength can be intense at times. Apothecary Extracts has shared with me 53 uses for Tea Tree Oil in their e-book and if you purchase their oil, you get the book free. I'll share with you a recipe below from the fabulous book plus inside the book their are so many more recipes and uses! Some of my favorite uses from their e-book or most clever uses are listed below. To make some of the items listed above, you'll need to have a few oils/ingredients on hand. I'm a huge proponent of less is more and with all the above listed bullet points, you can feel better knowing exactly what you're putting on your body. One easy recipe that most people have the ingredients on hand is the All Purpose Cleaner. Shake well prior to each use. This works great for spot cleaning and as an antibacterial spray. Are you convinced of the great uses of Tea Tree Oil yet? Want to get your hands on something good? I would love to try the all purpose cleaner recipe! !